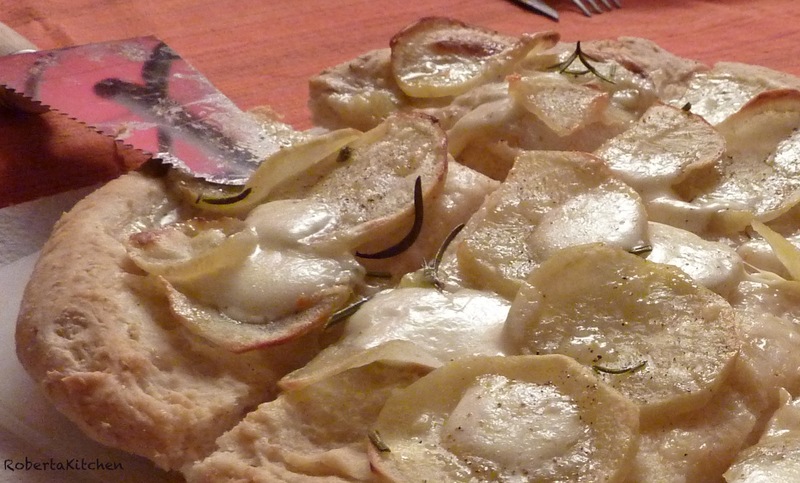 Here is another pizza topping, very famous here in Italy. When there is no tomato on the topping we use to call it focaccia instead of pizza….so focaccia potato and mozzarella would be more appropriate!. I’ve made it last weekend and my friends LOVED IT…. While the dough is raising. peel 1 big potato and cut into very thin slices. ( about 1 mm – 0.47 in) and put the slices into boiling water for 4/5 minutes. Once you have streched the dough from the middle out by your hands. Sprinkle some flour on a baking pan and put the dough on. Spread some extravirgin olive oil all over the dough and add the potato you have already prepared. again put some extravirgin olive oil all over it , salt, black pepper, rosmery. Put in the oven ( 420 F°) please notice that the fun must be turned off!! Put the shredded mozzarella all over it just few minutes before taking the pizza off the oven….